Well, Labor Day is behind us now and it is all bit a technicality to wind our way into the cooler days of Autumn, We should be getting chillier temperatures later this week that are more seasonal after this late season heat wave. Apples are coming in big now, but peaches are still in plentiful supply at the markets with very good prices. A sack full will lend itself to making this tasty dessert. And this recipe I am making as part of the Blogger C.L.U.E. society, a group of like minded foodie blogging pros, and we do this on a theme, which of course, this month happens to be Fall Fruit. For this month I was assigned to explore the blog of AnnaDishes. Anna has had her blog going since January of 2010 so you know when you drop by there she has an archive stuffed tight with delicious recipes. Like my blog, Anna just specializes in good yummy food, with a broad selection of recipes in all categories. 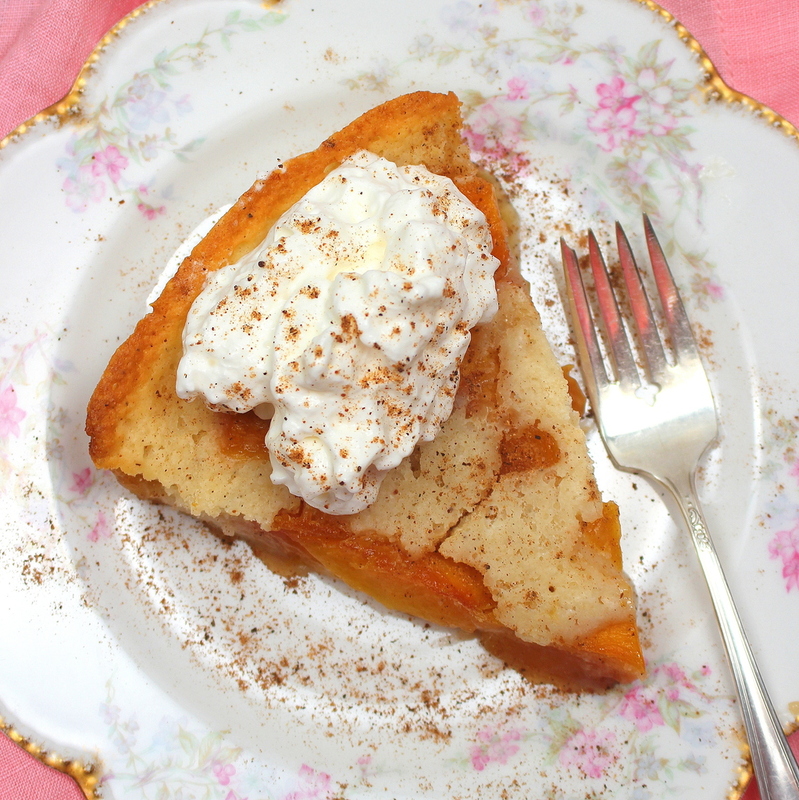 I decided to make Anna’s version of the Peach Buckle, which has passed around BloggerC.L.U.E. from Heather at girlichef, who developed this delicious buckle as part of a Gallo campaign. Heather used Gallo Riesling instead of Prosecco. And I in turn used Gallo’s Sweet White blend, which I in turn had leftover from a Gallo campaign I recently did myself as part of Sunday Supper. Of course, as this recipe gets passed around, you are the next one that gets to make it, and you will be happy you did either with wine, or with peach nectar/juice if you prefer. It is more like coffee cake than anything, with enough fruit to make it seem a bit like a cobbler or shortcake. The key to this really is in using the cast iron, as it causes the crust around the edges to get delicately crisp like a pie crust, and that in my opinion puts it right over the top. So make sure you do pull the cast iron out of storage, if it isn’t out already. I’d say I hope you will enjoy, but I know you will. Awesome recipes using Fall Fruit from the Blogger C.L.U.E. group! Peel peaches using a paring or bird-beak knife. If they are hard to peel, score an “x” in the bottom and dip into boiling water about 30-45 seconds then remove and plunge into cold water. The skind should have sufficiently loosened to make them easy to peel. Cut in half, discard the pit, and slice, placing slices and any juices in a bowl. Preheat the oven to 375ºF. with a 12-inch cast iron skillet on the center rack while it preheats. You can use an oblong baking dish but I am warning you that quality will be lost there. While the oven heats, whisk together the sugar, brown sugar, cornstarch, salt and wine in a large saucepan and bring to a boil. Stir in the peaches and simmer a couple minutes then remove from heat. Stir in the vanilla paste as it cools. Drop the butter into the preheating skillet and allow it to melt in the oven. Whisk together the batter in a mixing bowl: flour, sugar, baking powder, salt, nutmeg and buttermilk. Pull the skillet out and ladle the batter into the skillet- do not stir into the butter. Use a slotted spoon to drain peaches (reserving liquid) and place peaches evenly over the top of the batter, then drizzle peaches juices evenly over all. Bake for 45-60 minutes until it tests done. Allow to cool, then slice into wedges and serve with ice cream or whipped cream, as desired. Wow, I could go for a slice of that about now. Beautiful choice. What happened to the sausage recipe from yesterday.Cannot get it. That was a private post (not my recipe) that went public by accident. I can email you the ingredients list. Just use my contact form and put sausage recipe in the subject field. Peaches are my favorite fruit to bake with—so your gorgeous buckle looks right up my alley!!! This sounds delicious. It is still peach season here in Michigan as well. This looks so lovely! I also like that it is made in an iron skillet! I’m going to make it for mom with some peaches I have left in the pantry from the weekend! 😀 I think they liked it. I did too! I could seriously sit down and eat that entire thing. I have never had anything like this before, but man it sounds awesome. WOW! This looks so attractive! Great pics! For us who are not boozers, (LOL) what if anything can we use to replace the wine? As I mentioned in the ingredients, you can use peach nectar (canned) or any peach type juice from the grocer refrigerator case, or even frozen (although I am not sure if I have ever seen frozen peach juice concentrate). Barring that, you could even substitute simple syrup, which is equal parts sugar and water, dissolved. Well, you know I like this one! Your version sounds absolutely delicious – the perfect way to use up the last of the summer peaches. Yes I do know you like that one! Great recipe and thanks. This looks delicious! I’m not much of a baker, I’m a good eater though. Lol. But this looks like something I can make. It’s very easy, about as easy as making pancake batter and warming some soup really. I just imagine this would be great with other fruits as well. Looks delicious! This would be an amazing dessert for us. I’ve totally been in the mood for peaches lately. That is one stunning dessert! I must make this really soon. Nice choice! Hmm sounds like a good recipe to my on my dessert bucket list! I love peaches and have had peach cobbler quite often! Do give it a try–it is so easy to make! It looks like a pie that’s perfect for a relaxing weekend afternoon. Will it go well with a scoop of vanilla ice cream? I think so! There is nothing better than a sweet peach… Unless it is this delightful buckle!! I don’t blame you for using this recipe too….it looks amazing! I’d probably go with a reisling or other sweet white wine like you did. We still have fresh peaches pouring in to the farmers markets so I might just have to pick some up this weekend. It’s a great use for fresh peaches—easy too. And it can also be made in winter with frozen peaches, so come January, we can eat in style! This looks so deliciously yummy! Thanks for sharing the recipe. Love it! yum. I love peaches! this cake looks amazingly good! We’re not having any of that chilly weather here in San Diego… but even with this heatwave I’d turn my oven on for this buckle!! Peaches are a favorite of mine, but unfortunately we haven’t had good peaches around here this year. I think as a matter of fact we’ve had two all season… to be exact. I’ve never seen this done with peach before! Looks yummy! I love that this is a one pot dish. Looks like a great dessert. Absolutely beautiful. And you can have “cake” for breakfast! This looks SOOO Delicious! I would love to make something like this for the kids and myself!